WildStar, Carbine and NCSoft’s blindingly bright sci-fi MMO, will soon launch on Steam along with new bundles for those willing to throw down some cash. And if you’d rather not, don’t worry, as it’s still free-to-play. If you want to sink days into a new world, why not check out our list of the best MMORPGs? The store page is active on Steam, and you’ll be able to grab the game for yourself on June 9. 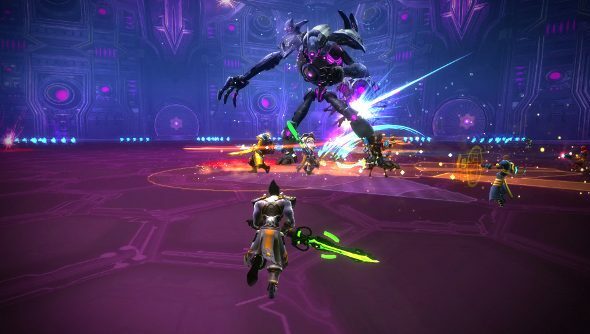 We first reported that WildStar might be launching on Steam over a year ago, not long after the release of Invasion: Nexus, when the developer was also working on a big free-to-play update. It’s taken longer than expected, but soon you’ll be able to add it to your library. The premium bundles have yet to appear on Steam, though Carbine have said that similar bundles will also be available through the in-game store and will include cosmetics, pets, mounts and signature time, which confers XP, currency and cooldown bonuses. If you’re not sure if you want to invest time into yet another MMO, check out our WildStar free-to-play impressions. Nick called it more refined, while praising the full experience that free players could expect. WildStar launches on Steam on June 9.